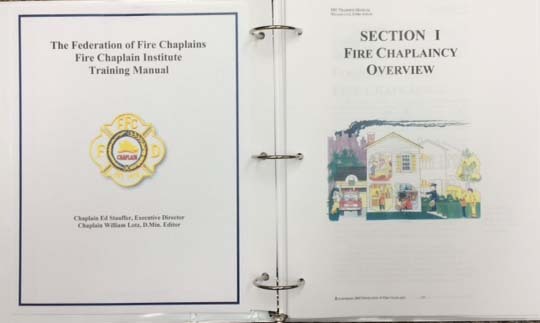 The official Federation of Fire Chaplain’s Fire Chaplain Institute Training Manual is now available! This manual contains all of the information from the Basic Chaplain Institute course PLUS many chapters of Advanced Chaplain material. This book is a representation of knowledge and experience currently within the FFC, but is not stagnant work. Your purchase will include updates with additional chapters as available until a complete new edition is published. These updates will be made available in the members section of the website. Every member of the FFC is encouraged to purchase one of these valuable tools. Get one for yourself and one for every other chaplain you know in your area. The 3-Ring Binder version is full color and formatted with wide margins for note-taking and references. Pages can be added easily as they become available or you can add your own notes from FFC Classes. The cost of the book is a minimum donation of $60.00 plus $10.00 Shipping & Handling. The USB version is handy to take along anywhere. It has all the same content as the binder and can be read on any PC or Mac computer with a USB port. The reader is included on the USB stick! Content may not be copied or printed from the USB version, it is a "read-only" format. The cost of the USB version is $30.00 plus $5.00 shipping & handling. We use PayPal as our credit card processor. YOU DO NOT NEED A PAYPAL ACCOUNT to pay online. Just choose "Pay with Credit Card"